Butternut squash risotto with tender grains of arborio rice suspended in a creamy white wine infused sauce. 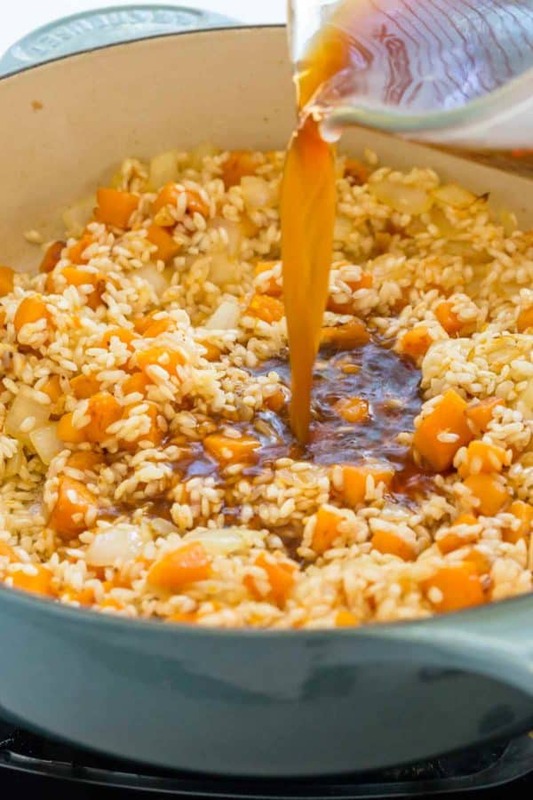 Risotto is a labor of love, so take the time to slowly simmer and stir the rice with warm vegetable broth to ensure all of the flavors are absorbed. For this recipe, I add small pieces of bright orange squash for a hint of sweetness that I think you’ll enjoy! This butternut squash risotto incorporates bits of the winter vegetable to add nutty butterscotch flavor to the savory rice. The great debate is if risotto should be eaten as a side dish or entree. Grains are often regarded as an accompaniment to a protein, but on Italian restaurant menus, risotto shines on its own. It’s a simple and sophisticated dish, made of starchy short grain rice, wine, stock, and cheese. Unlike common boiling and simmering methods for cooking rice, risotto demands your physical presence and awareness. You must watch over its progress like a helicopter parent caring for their newborn child. I find making this dish therapeutic because you’re fully engaged in the sounds, smells, and tastes. Daily life stress just floats away. Using butternut squash as an ingredient can be intimidating, but practice makes perfect. The thick outer layers require a little creativity to remove. A vegetable peeler surprisingly can cut away at the skin with ease. Once I figured out how to cut butternut squash, I love adding it to various dishes like mac and cheese, and tacos. For this recipe, I found it easiest to briefly saute diced squash first, before adding the rice. This process allows for the edges to soften and develop more caramelized flavors during the saute step. Another option is to separately make roasted butternut squash in the oven, then stir in at the end of cooking. I prefer one pan approach to minimize dirty dishes. Plus, the starches from the vegetable have more opportunity to thicken and make the dish richer and creamier. Saute the butternut squash with butter to lightly brown the surface and intensify sweetness. Briefly cook the rice in oil to lightly toast the grains for a nutty flavor. The wine should completely evaporate before adding in the stock. Add the warmed stock in 1/2 cup increments to allow the rice to gradually absorb the liquid. Constantly stir the rice to release the starches, this thickens the cooking liquid and keeps the granules separate. How do you know its ready? After a few overcooked plates of clumpy blobs of rice, I had to take a step back to figure out where things went wrong. The truth is, there is no shortcut or set and forget mindset. Dedicate at least a solid 30 minutes, to stir, pour, stir, and repeat. With the great volume of liquid you’re tasked to incorporate, it seems like magic that the tiny riso, or rice, could absorb it all. Then finally it happens, when you think you couldn’t stir a moment longer, the rice becomes tender, yet slightly chewy, and suspended is a luscious sauce. Bellissimo! Stirring in freshly grated aged Parmesan cheese instantly locks all of the grains together in a cheesy, creamy union. Sprinkled with chopped parsley leaves and cracked black pepper, a piping hot bowl must be enjoyed immediately. The butternut squash adds a festive fall and winter taste, perfect for highlighting seasonal ingredients and adding variety to your meal. The naturally occurring starches on the outside of the rice grain add richness to the risotto. It provides thickening properties when heated with a liquid, and stirred over time. It adds a punch of creaminess to the texture of the dish. An Italian fall side dish or entree, butternut squash risotto is made with tender grains of arborio rice suspended in a creamy white wine infused sauce. In a large pot, add the vegetable stock and heat over medium-low heat until warmed. In a Dutch oven or a large sauté pan with high sides, melt butter over medium heat. Add butternut squash and salt, stir and saute until lightly browned and softened, 6 minutes. Add 2 tablespoons olive oil, once hot add the onions and garlic, and cook until soft and translucent, about 3 minutes. Add arborio rice and stir until the grains are coated with oil, cook for 2 minutes. Add the wine to the pan, stirring until the wine has evaporated. Add warm stock, 1⁄2 cup at a time, stirring frequently. Add more stock once the liquid has been almost entirely absorbed by the rice. Repeat adding the stock in 1⁄2 cup additions as the liquid is absorbed, frequently stirring, until rice is tender yet slightly chewy, about 25 to 35 minutes. The desired result is a nice pudding or oatmeal consistency that is loose and not a big clump of rice. Turn off the heat and add Parmesan cheese. I have had zero luck with making risotto. I hope I can pull this one off. Is there a favorite brand of arborio rice you use? I know you can! I don’t have a specific brand, the ones from Italy are a bit more expensive but I have used some from the states and they work well in recipes too. Let me know how it goes! This recipe was easy and so delicious, enjoyed by family of 4. I Have made risotto a couple times but the caramelized sweet flavor from the sautéed butternut squash was awesome! Substituted veggie broth for the chicken. This was delicious!! Thank you! Everyone loved it and I love your recipes so easy to follow and not a long list of unusual items!